One of my favorite things is to discover new books by new authors who I love and it’s even better when those authors agree to talk to me about their writing! 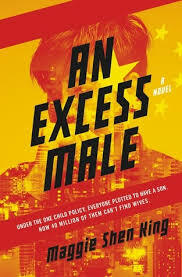 I was thrilled last year to discover An Excess Male, an intriguing and unusual dystopia set in a futuristic China, written by author Maggie Shen King. The book made it on to a number of awards lists and was roundly lauded as a remarkable debut novel. See some of its many accolades here. JL: First of all, let me say how much I loved An Excess Male. I read a lot of sci-fi and dystopia, but have never read anything quite like this book. What gave you the original idea for the story? MK: The idea came to me about five years ago from a newspaper article on gender imbalance in China. The One Child Policy and the cultural preference for sons had given birth to 30 million men who will not be able to find wives. Lasting nearly 40 years, the policy has become one of the longest-lasting and largest-scaled social engineering experiments of all time. And the massive gender imbalance was not the policy’s only unintended consequence. It messed up the composition of the country’s population; there will soon be insufficient working adults to support the incoming surge of retirees. It created a huge underclass of unregistered illegals consisting of illegitimate or second-born girls whose parents could not afford to pay the fines to document them. It fostered a system for bribery and embezzlement. The One Child Policy was a case where reality was stranger than anything fiction could dream up. JL: The book switches between the points of view of a number of different characters, and also shifts from first to third person between several characters. How did you decide on the voices you wanted to share and the decisions whether to present them in first versus third person point of view? MK: I explored the initial story concept by writing a twist on the marriage plot with a male protagonist at its center and a government that has called upon its families to demonstrate patriotism by taking on additional husbands. This book started as a short story—the current first chapter without the scene at the Ministry of Defense. I wanted the central character to be a typical “excess” male, a less educated man who finally saved up enough dowry to qualify for marriage in his mid-forties. For Husband One and Two in the family he was seeking to join, I chose men without financial constraints, but who for other crucial reasons wanted or needed to share a wife. And finally, I made the wife in this polyandrous marriage young, naïve, and a product of the times—the offspring of greedy daughter breeders. Initially, I told the stories of three of the four main characters through the first person perspective. I felt that Husband Two’s temperament kept him one step removed in most interpersonal transactions and that the third person viewpoint, being also one step removed, served that purpose better. After reading the first few chapters, my writing group found the existence of so many first person viewpoints somewhat stifling. Since the story was a marriage plot, I kept the potential marital couple in first person and changed Husband One to third. JL: Several of the main characters are incredibly nuanced and complex men trying to cope in almost impossible societal and personal situations. In particular, you’ve included male characters attempting to cope with very gendered societal roles and also with intellectual disabilities (for want of a better term). What were the main challenges for you as an author in creating characters struggling with these particular issues? MK: I love characters with mighty struggles. Their situations are meaty, full of conflict and built-in drama. I think it is important to master some very concrete details of their struggle and understand their point of view. It is important to show characters, faults and all. Their situations on their own often elicit much reader sympathy. They become complex, full-fledged characters when writers show not just their courage and fight, but also the ways in which they are selfish and weak. JL: The book also takes on the idea of very non-conventional family structures. 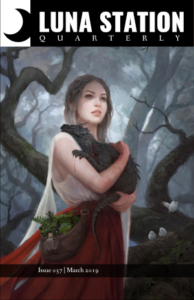 What was your inspiration for setting up the society in this way, and what were the main challenges you faced, or aspects you enjoyed, about imagining a society where families might consist of multiple husbands, or parents, and how those roles would play out within the families? MK: Traditionally, Chinese people lived in multi-generational households. In addition, wealthier men often housed multiple wives under one roof. In poorer parts of rural China, families that did not want to divide a piece of land between brothers or families that needed additional farmhands sometimes asked the women to take on another husband. Both polygamy and polyandry were practiced. In Chinese television and film, these complex relationships were often fraught with palace-level intrigue. Wives jockeyed ruthlessly for position while children mastered power dynamics at an early age and became experts at currying favor. In my novel, I was interested in exploring the fundamental and everyday realities of one such family. By pitting it against an authoritarian state, my hope was that its members would find the humanity in each other, unite out of both necessity and affection, and ultimately discover the true meaning of family. JL: While the book is clearly science fiction, it’s very grounded in contemporary realities about societal issues and governmental policies involving the way we treat each other as humans. Did you feel you were writing to a “theme” or with a “message” or did the inclusion of these issues arise organically from the narrative as you wrote? MK: I thought I was writing a marriage plot when I first began. I did not work with an outline, did not quite know where the book was going, and the story kept getting darker and darker. At one point, my brilliant writing group informed me that I was writing speculative dystopian fiction and had me scratching my head and desperately rereading the classics in the genre. All this is to say that for me, writing is very much a process of discovery. There is a subconscious element to it that defies the logic of outlines. I try to get out of the way of the story and allow it to unfold as organically as possible. Of course, my personal sensibilities cannot help but infiltrate the narrative. Science fiction is a lens through which to process the world, and I try as much as possible to illustrate issues through story action, to present both sides of matters, and let readers arrive at their own conclusions. JL: What are you working on now? MK: The more I learn about the One Child Policy, the more I am haunted by another set of its victims—girls whose hukou, or household registration, were saved for a younger brother. These girls, called heihaizi, or shadow or ghost children, are undocumented, illegal, and nonexistent in the eyes of the law, one of the policy’s unintended consequences I mentioned earlier. They have no rights to health care, education, or legal protection. They cannot legally ride public transportation, marry, obtain or inherit property, or have children. Thanks so much for sharing your time and work with the readers here. We’re looking forward to reading your future work! Next Is Science Fiction Genre Fiction?